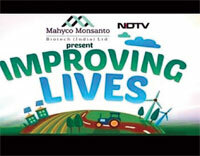 In the wake of growing protests against its collaboration with US agri-biotech giant Monsanto, NDTV has stopped its campaign Improving Lives. The channel, however, said the series was meant to highlight the state of infrastructure and development opportunities in India and had nothing to do with agriculture, seeds or geneticallymodified food-something for which Monsanto is often criticised. Anantha Sayanan and GreenpeaceX, or Greenpeace extra, set off a signature campaign against the partnership much before the Facebook page was launched. They charged Monsanto of crime against nature, rights of farmers and consumers. “Now it is trying to clean up its public image,” said Sayanan. More than 2,600 people had signed for Greenpeace’s campaign till April.